The workhorse control in iOS is the table view. With both a delegate and data source it is powerful and flexible but far from simple. Table views have many uses. They can provide navigation much like a Tab bar. Tab bars use them in the more tab. They work very well for selection and listing of long amounts of data, as they are scrollable. As the basic unit of a table view, a cell is a view itself. As a subclass of UIView, cells customize easily. Sections here have their own headers. Under the headers are rows. For Deep Dish Pizza, we have several types of pizza, such as Sausage, Meat Lover’s, Veggie Lover’s and so on. The developer has control over the way rows and sections set up. 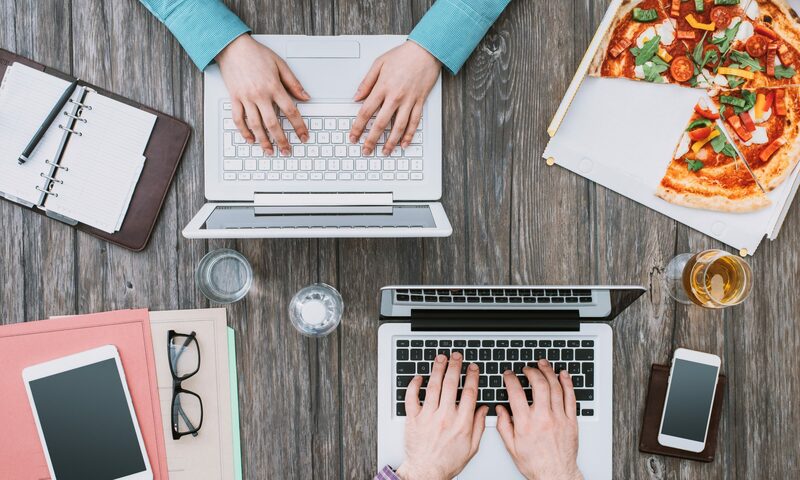 There are two types of Table views: Static and dynamic. Static table views have a specific number of table sections and a specific number of rows in each section set at design time. They are easy to set in the storyboard. As table row cells are views, you can place any control you want in a cell and format using Auto layout. You can find a good example of a static table in any settings page like the one on the right. Static tables also make a way to perform navigation using Navigation controllers much like tab views. Dynamic tables generate the table from data, and can change during run time. The pizza menu to the left is a dynamic table, generated by an array for the sections and an array of arrays for the rows. It can even generate its own background for each cell. Once you understand basic table views, you can edit the table view dynamically at run time, adding, removing and recording the data in the table. There are many apps that are complicated Dynamic table views. Social media apps like Facebook, Twitter and Instagram are dynamic table views with sophisticated layouts. We will build part of a menu application to demonstrate both static and dynamic tables. You can download the entire completed project here: swifttableviewdemo.zip Make a new project with Command-Shift-N or File>New>Project… Name the project SwiftTableViewDemo. Set the device to Universal and the language to Swift. Go to the storyboard. Delete the current view controller on the storyboard. Drag a Table View Controller to the storyboard. 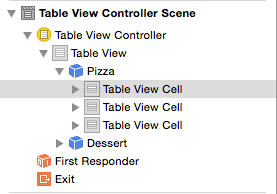 Select the new table view controller on the storyboard. In the attributes inspector, click on Is Initial View Controller. From the drop-down menu select Edit>Embed in>Navigation Controller. The story board should look like this. In the navigation bar, drag a bar button item into the upper right corner. Title it Order. This button will launch the table view. Our root view will show our pizza and dessert order after we get it. We will code this view last. Press Command-N for a new file. Select a Cocoa Touch Class which subclasses UITableViewController named RootTableViewController. Use Swift as the language. Save the file. There will be a lot of commented out code here. In its current state the code will run, but do nothing. Go back to the storyboard. Select the table view and in the identity inspector, change the class to RootTableViewController. We need to make two changes to the table view in the attributes inspector. You may find table views are difficult to select views on the storyboard. Use the document outline. If not already open, click the button in the lower right of the storyboard to open the document outline. In the outline find the Root Table Controller. Open up the arrow next to the root controller then the table view. Click the Table View Cell. In the properties inspector, set the Style to Basic, and the Identifier to cell. Drag a table view controller to the right of the view controller. Control drag from the order button to the Table View Controller to make a segue. Select a show segue. Click the segue and give it an identifier of Order in the properties inspector. Get a new file by pressing Command-N. select Cocoa Touch Class subclassing UIViewController. Name the file FullMenuViewController. Use Swift as the language. Save the file. We did not use the UITableViewController for a subclass to get a less cluttered class. 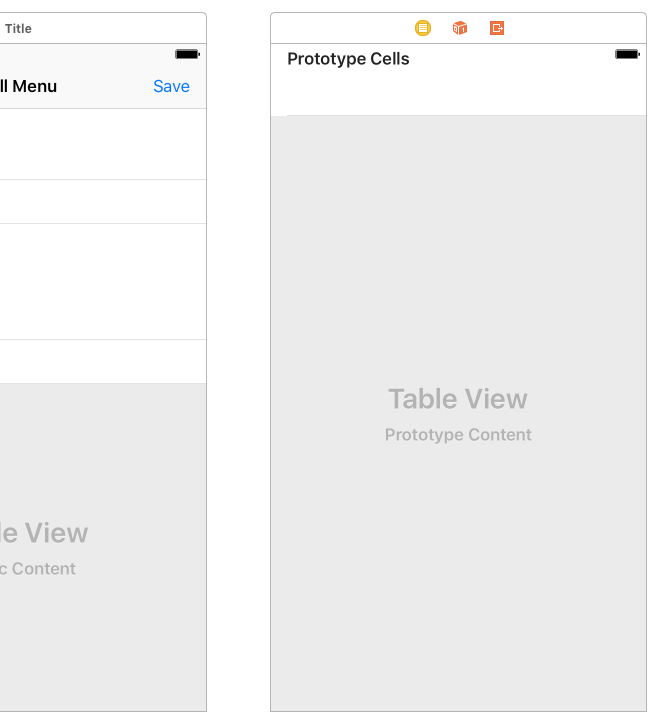 To work as a table view controller, Change the superclass to UITableViewController. Go back to the storyboard. Click the view controller icon. In the identity inspector, change the class to FullMenuViewController. In the document outline, click the Table View for the FullMenuViewController. In the property inspector, change the content to Static Cells. The table will now change from Prototype content to static cells, and have a different arrangement. Change the sections to 2, and you will get two sections with headers. In the document outline, Select Section-1. 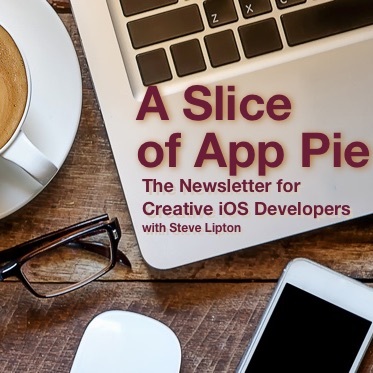 In the properties inspector, change the Header to Pizza. Select Section-2. In the properties inspector change the Header to Dessert. Change the Rows for the table view section to 2. We have configured the table to have two sections. The first section will have three cells. The second section, the dessert section, will have two cells. 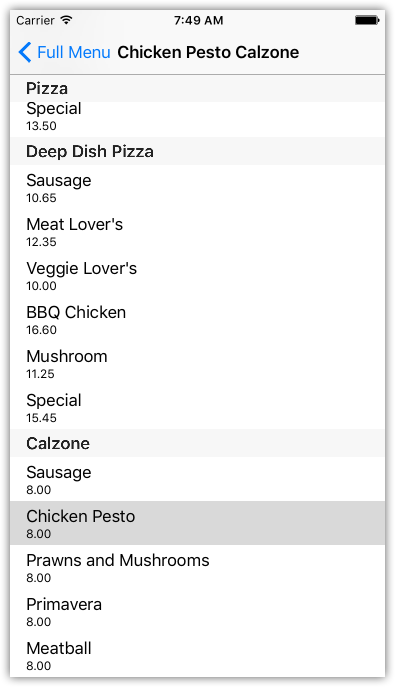 Open up Pizza in the document outline, and there will be three table view cells. 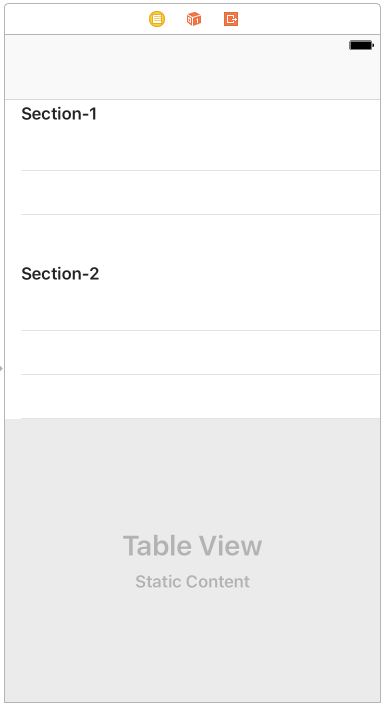 Select the top Table View Cell in the document outline. Change the style to Basic in the properties inspector. The storyboard will now have the word Title on it. Open up the Pizza until the title is visible. Select Title. In the attributes, Change Title to Pizza. In non-custom layouts, there are one or two system labels applied to the table view cell. We can change those labels like any other label. Add a bar button for saving our order. After your first table controller, navigation bars do not get included in the controller on the story board. You need to add them yourself. If you don’t, you will not be able to drag a bar button to the upper right corner. Dragging a Navigation Item to the gray area for the navigation bar. In the attributes inspector, set the title to Full Menu. Now you can drag a bar button item to the upper corner. Set the Title to Save. Drag another table view onto the storyboard. A dynamic table view appears by default. Drag the new table view controller to the right of the full menu view controller. 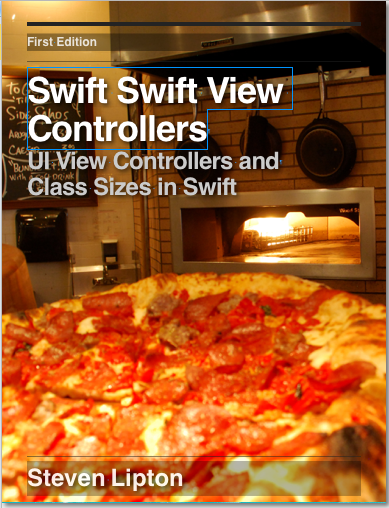 We’ll make one view controller, and hook up the three pizzas to it. In the document outline, control-drag from the Pizza cell to the new table view. Make a show segue. Make a segue identifier named Pizza. 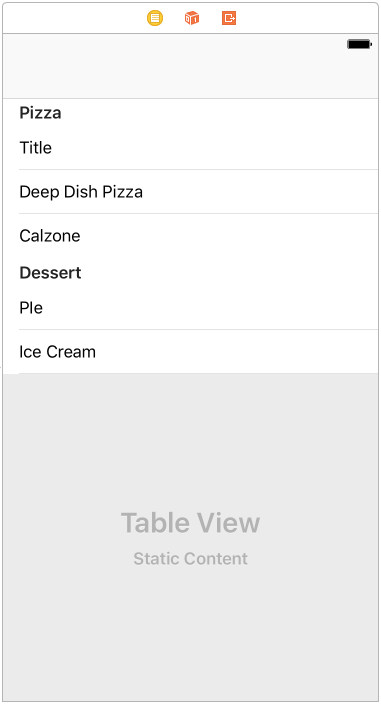 Control-drag from the Deep Dish Pizza cell to the new table view. Make a show segue. Make a segue identifier named Deep Dish. 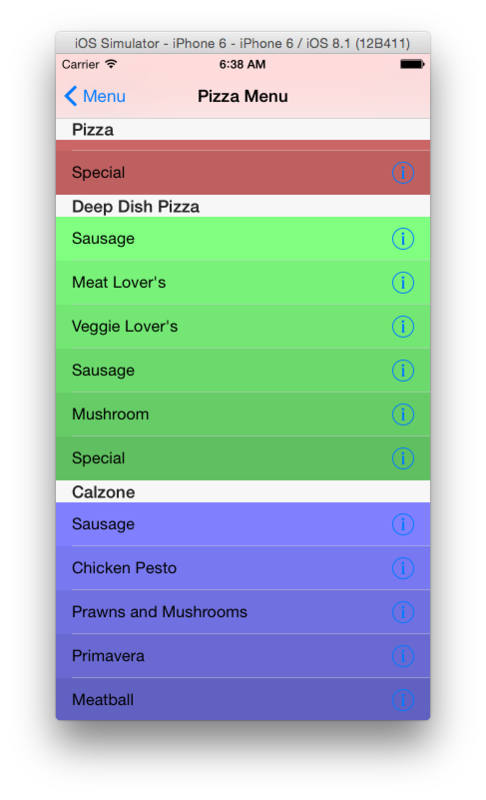 Control-drag from the Calzone cell to the new table view. Make a show segue. Make a segue identifier named Calzone. Drag a Navigation Item on the scene’s navigation bar. Change the title to Pizza Menu. There is only one cell for the prototype cell. Select the cell in the document outline. Change the style to Subtitle. Under the style, you will find an identifier. Change the identifier to cell. This is the reuse identifier. When we code cell contents, we will use this to identify the cell. You may have more than one kind of cell. This is a way of keeping them organized. 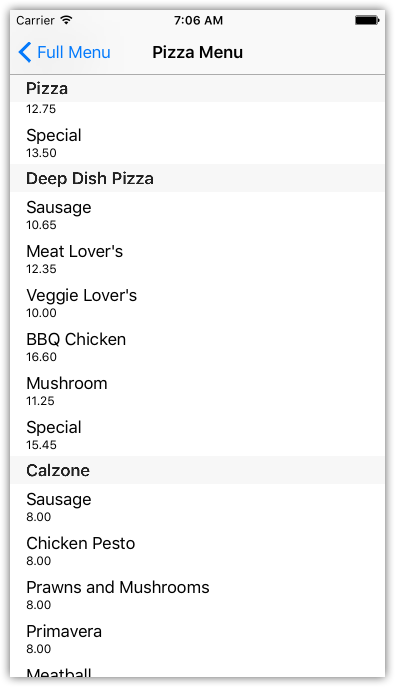 Build and run and you will be able to navigate from the order button to the order view, and from the pizzas to the blank table view controller. Before we start coding the table view controllers, we need to make not just one but two models. We will need the model that will carry our order, and a class that will define the list that goes into the table view. The model is a String for the name of the menu item, a Double for the price and a Bool if it is a special. You can initialize all three values with an init method for the class. The MenuItems class is very abstract. Our table view will require a array for the names of the sections and another array of the same size as the sections array. In that array we will stick arrays as elements which are the sections. This array of arrays will reference every section and every row in that section. The property sections is the string array containing the names of the sections. The property items is an array of arrays, hence the double brackets for [[MenuItems]]. We add a section of the menu table by the method addSection, which adds the section and the item array to the existing property. We could use this class one of two ways. We could make an instance of MenuItems within the view controller and then use the addSection method on the instance. That is a lot of code and data in a view controller. I can only use it in that view controller. A more flexible approach is subclassing MenuItems. Under the MenuItems class, add this. I subclass MenuItems with PizzaMenuItems. When I instantiate this class, I add the data to the properties of MenuItems. I can make an instance of PizzaMenuItems whenever I need this list. We next code the table view controller. We did subclass TableViewController for the RootTableViewController, but like many Apple templates, it has a lot of confusing extra code sitting in comments. 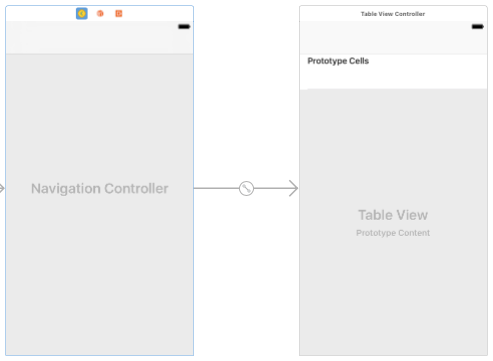 To simplify things and to illustrate more effectively what you do need get a table view controller working, we will subclass UIViewController and then make a few changes. This returns the count of the number of sections. The parameters for this method are the tableView, and a NSIndexPath called indexPath. NSIndexPath has two properties of interest: section and row. The dequeueReusableCell instantiates a UITableViewCell for us, associated with a specific indexPath in the table. Once we have a cell, we configure it. Usually with table I like to use row and section, so I make those constants. I then get the MenuItem object menuItem, which is the menu item for this row and section. Getting this first saves a lot of extra, confusing typing. textLabel is a UILabel found in the cell. I assign to the text property of textLabel the name of the menu item. I convert the price to a string, and then display it in the second built-in label detailTextLabel. For all cell formats except Basicn and Custom, this will show a smaller label. This method returns a string which is a title for a header row. We use the array menuItems.sections to give a title. In this method, we have indexPath for a parameter. I created constants row and section that make working with these values a little easier. I get data from our menuItem object, much like we did in cellForRowAtIndexPath and titleForRowInSection. I got the current menu item then appended to string name detailing the type of pizza from the section. I placed order in the title of the navigation controller bar. Build and run. Now the tapped row flashes, but does not stay solid. This gives feedback we tapped the button, but does not stay on. If you want all your user feedback to be the label on top, you can set animated: to false. While the app can select an menu, it cannot pass it back among the controllers. Like any other Navigation controller, we delegate the data back to the root controller. To get back to the root and display our selection, we pass the model through the full menu we made. If you are unfamiliar with delegates and how they work, you might want to read this lesson on delegates first. That is our simple generic protocol, which passes the view controller and the model back to the calling controller. Add the required method for the delegate. In this case we want to update the model in this view controller, then dismiss the calling view controller. Since we lose feedback of what we selected in the pizza menu, we added a line to display the passed order as the navigation title. Dynamic table views change. User input can change them, adding cells as we do interactions. We will have the RootTableViewController list the items we order.This needs an array of OrderModel. Press Command-N to make a new file. Make a Cocoa Touch Class in Swift subclassing NSObject. Name it OrderList. Compared to the PizzaMenuViewController, there is a lot of code here. As I’ve mentioned, I tend to make my own TableViewController whenever I can. Unlike the pizza menu we have only one section. Under the numberOfSectionsInTableView, is numberOfRowsInSection. Replace that code with this. Like PizzaMenuTableViewController, we count the elements in the array to return the number of rows in each section, though this time we have only one section. Our last required method is under numberOfRowsInSection . Remove the block comments from cellForRowAtIndexPath and change the code there to this. Be especially careful to make the identifier cell. It must match the identifier we set up in the storyboard. Our last step is get the order from FullMenuViewController. Go to the storyboard and open the assistant editor set to automatic. Select the bar button in the FullMenuViewController scene. Control drag from the Save bar button to the code. Make a action for a UIBarButtonItem called saveButton.. Close the assistant editor and go back to the FullMenuViewController code. We add the order to the list, then dismiss the controller. Once dismissed we update the table. Build and run. Select a few menu times and save them. you will see the table grow on the root screen. 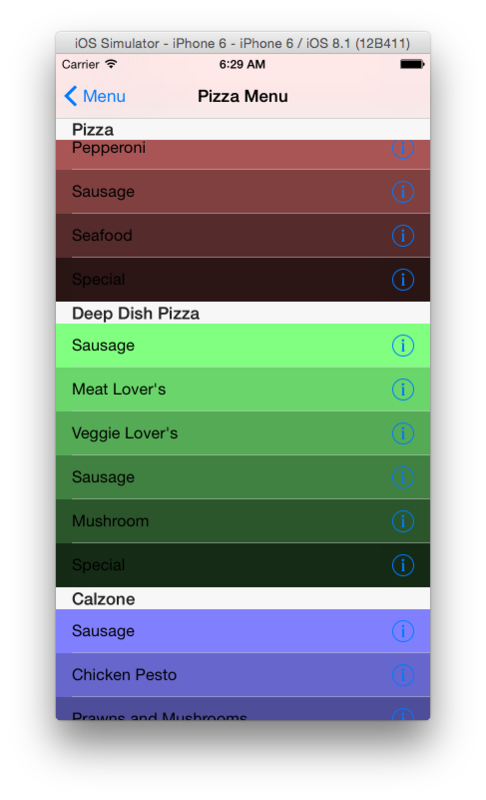 Table views are one of the most powerful and often used controls in iOS. Social media platforms such as Twitter, Facebook and Instagram are all table views. So are Messages and reminders. 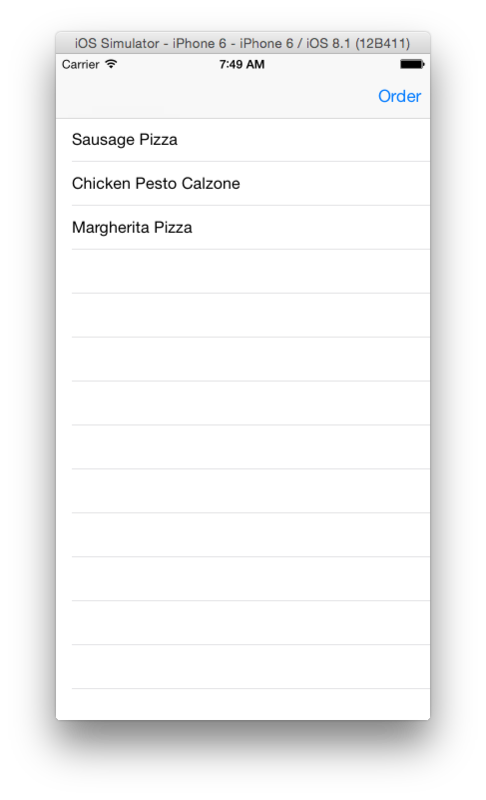 Ordering applications such as this pizza application use table views as well. While this has gone into depth on presenting both dynamic and static tableviews, there’s a lot more to learn. Mastery of UITableView is essential for your developer toolbox. This is a lot of code. You can download the completed project here: swifttableviewdemo.zip I’ve broken the code into models, protocols and view controllers for the easiest consumption. //  Created by Steven Lipton on 10/1/16. //  Created by Steven Lipton on 10/2/16. Thank you for the GREAT tutorial! I’ve been working through it and found one change (in Swift 1.2 at least). In the section Selecting a Cell, line number 5 should be self.title = order not navigationController?.title = order. At least that was the change I needed to make to get it to work based on that part of the tutorial. You modify that code later on in the tutorial, but I haven’t gone that far yet. I’ll have to look into that. thanks for the catch. It should be navigationItem.title = order. not navigationController.title. Sorry for the long post. Here are the corrections for the rest of the article to make it work with Swift 1.2. Note the removal of previous self.title = order which while obvious for experts may stump beginners. This is to keep in line with the pattern changes in Swift 1.2. 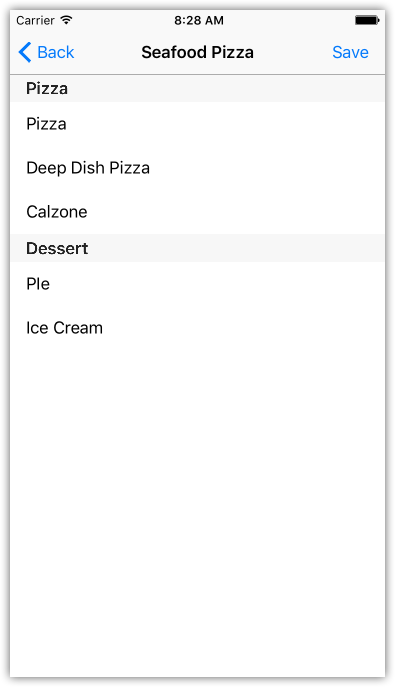 Or else the App will crash when you select a deep dish item (or you can change the PizzaMenuItems MenuItems to include “Deep Dish” instead. The templates were updated as of the latest Xcode (6.3 beta 2) to match this pattern. You may want to inform readers to switch to UIBarButtonItem instead of the default AnyObject on the control drag to make an Action to prevent them from having to modify the code. Again keeping in line with the above pattern changes. Finally, if you followed the instructions step by step in the end your App crashes. At the end of the section “Table View and Navigation Controller” the text says to set the identifier to “Cell” while the image shows “cell”. If you follow the image, it works, but if you typed the instruction version you’ll crash, and its not in an obvious spot. Stepping through the code you’ll quickly discover it, but it can be a bit frustrating for more novice programmers. I guess one more, apparently you like Sausage as Deep Dish has Sausage twice. Thank you for the corrections. I decided to keep with the production version for now, and I’ll update the code when 1.2 becomes production since these changes will not work in the production version. I will write another Joys of Beta Swift about Apple’s changes to downcasting in the meantime. I fixed the typos so the segues and reuse identifiers match. The PizzaMenuItems class has nothing to do with the segue identifier. The segue identifier was explictly set in the storyboard attributes inspector for the segue. The code as written is correct and runs perfectly on my system. So I’m not sure about that. you might check your segue identifier. Hi, I’m having troubles with getting the selected menu items to show on the RootTableViewController. Everything works fine, though. Its just that the items don’t show on the main view. Any suggestions why this may be?? Check the delegate is set up properly. 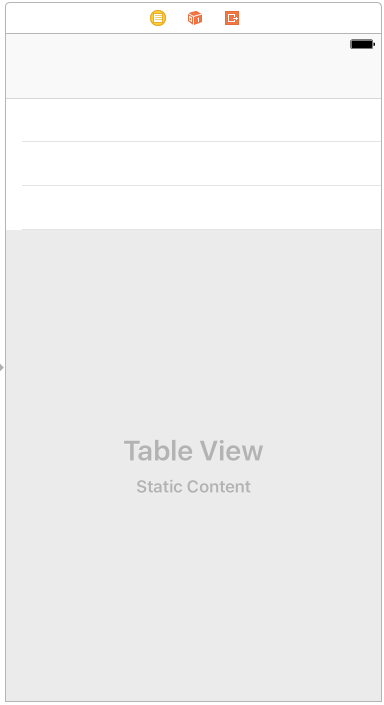 tableView.reloadData()  // for Swift 1.2 -- table does not auto- reload. I’ll change the post to reflect this. I came to the same conclusion (and fix), although still trying to work out why it should be different across the two versions. The 1.2 behaviour makes more sense to be, as there’s no reason why the tableView should know to refresh the data when it comes back to the top of the stack – it’s not aware of the underlying data change (as it would be in a CoreData managed object). Can’t find anything about it in release notes, but that seems to be what is going on. 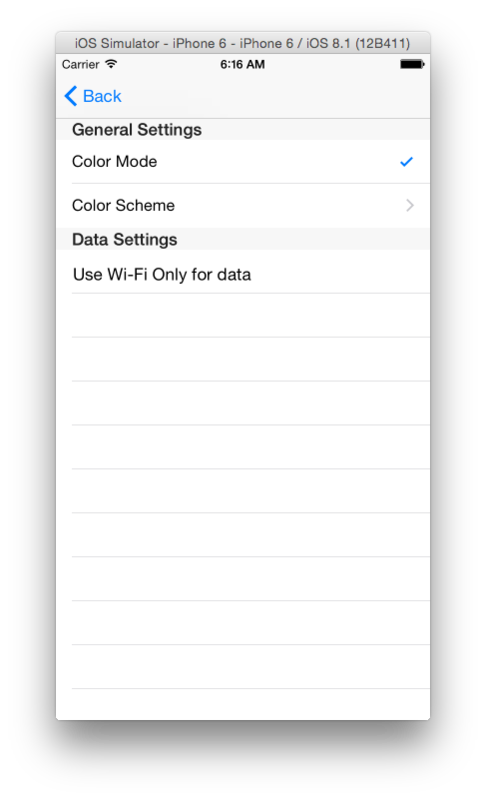 Pingback: SWIFT SWIFT TUTORIALS: INTRODUCING TABLE VIEWS | Dinesh Ram Kali. I am trying to modify my RSS reader App that is already on the Apple’s App Store. You can check it out here: https://itunes.apple.com/us/app/vi- consortium/id1003059882?ls=1&mt=8. The RSS feed I use has an image tag for each article. I wanted to know how to include it in each cell. Any help would be greatly appreciated. Kindly email me at timbojill@gmail.com. I don’t come here that often. I used the example posted on this other site: http://sweettutos.com/2015/03/30/develop-rss-feed-parser-app-in-swift/. There is a link towards the bottom of the page right below the comments section with the complete source code. It works but the author didn’t include the part about including an Image tag and placing it in the cell. Kindly email me at timebojill@gmail.com if you can help. You’ll need a custom cell, set up with the image tag. I’m afraid I’m not in a position right now to give you specific help. You are correct. fixed. thanks!!! I may be getting confused but does the “modifer” property of the OrderModel class ever get used? No, it wasn’t used. That model class gets used in a lot of my code, going back to June 2014. I don’t remember where but modifier was used somewhere else. Im having some trouble adding a new section using an array. and see if the element count is correct. As I posted in my last reply, the data source method tableView:numberOFRowsForSection: should give you predictable results if you put a print in it. If the number of row is zero, it’s not getting into the array. Trace back where it is not getting into the array. If it prints nonzero numbers, then check in tableView:cellforRowAtIndexPath: for something that is causing trouble displaying your data. Get rid of additems. Place the code from that method in your code for JSON above directly.
. See what’s in self.intro. Hope you find the problem. unwritten law of debugging: It’s always the Oops!!!! 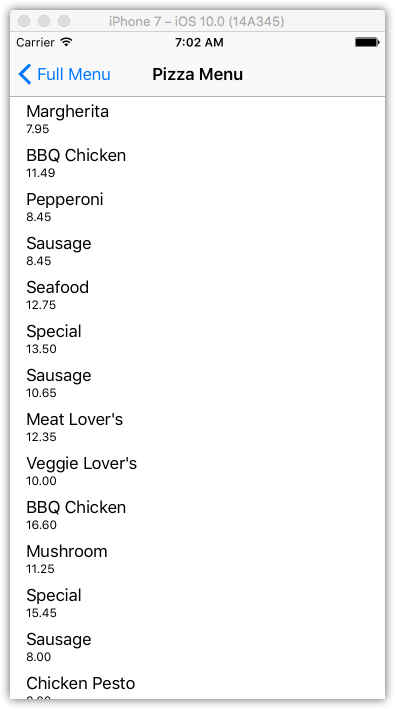 Design-wise, wouldn’t it make more sense for the selection from the “Full Menu” to reflect the user’s choice (pizza / deep-dish pizza / calzone), and only present a “pizza menu” that is limited to one of the three choices? As it is, what’s the point of determining which segue.identifier is selected if all choices use the same code? I just commented out the three if statements and made prepareForSegue set the delegate with the code let vc = segue.destinationViewController as! PizzaMenuViewController and vc.delegate = self. Yes, the pizza menu could to show just the one we want. There would be two ways to get this: the first would be to make three dynamic view controllers, one for each selection. The other, better way would be to use a drill down table. Drill downs also requires a lot of explanation of code that is beyond the scope of this lesson. Check back later this week as I’m finishing that post. Let’s point out two other things though: What is best for the end user? A order app might not be so convenient for the server to go back and forth on screens. Scrolling might be a better choice, with a scroll to the section of the list where the server starts. I can’t forget the obvious: This is a contrived example for the lesson to introduce table view controllers. I’m packing as much as I can into as few words as possible. Expanding the lesson to make two more dynamic table view controllers does not add to the lesson enough for the words it would take. I left the segue that way for people to experiment with their own view controllers, which they could change quickly by changing the storyboard and the view controller cast to. That is the name of the model class for the table view. You might want to check your code for typos. See the section The Table View’s Model above.